When you install new flooring, you want something that’s aesthetically versatile, to complement your other design choices. You want something easy to clean and maintain. And you want something that’s going to last for years. One great option that covers all these criteria and more, is stone. 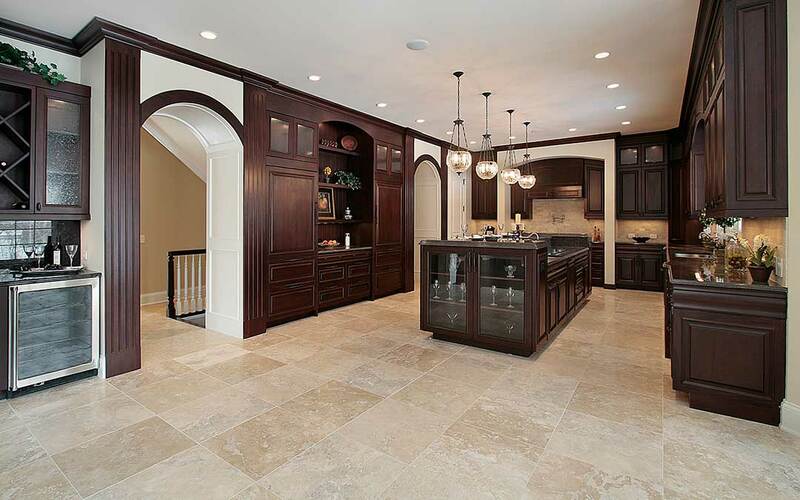 Here are some of the benefits of stone flooring. Durability. Stone is hard and strong. It will hold up under a lot more stress than most other types of flooring, and won’t crack or sustain damage as easily. It stands up under heavy foot traffic and is resistant to the scratches and abrasions that often come from heavy furniture. Because of this, a stone floor will last you for many years, looking just as great when your children and grandchildren walk on it as when you do. Or, if you choose to sell before that, you’ll find that a stone floor increases your home’s value. It’s a very popular choice that a lot of people are willing to pay a little extra for. Maintenance. Stone is one of the easiest types of floor to keep clean. A quick sweep every now and then will get rid of dust. Wipe up spills with a wet cloth or give the floor a mop—they’ll come up easily and won’t stain or damage the floor’s coloring. Indoor Air Quality. When you have carpet, the fibers are a magnet for dust and other contaminants. Then, walking over those fibers kicks the dust up into the air again, which can exacerbate allergies and asthma. With a stone floor, those allergens are easy to eliminate. Run the vacuum over the floor, and you’ll be able to improve your indoor air quality significantly, reducing contaminants and allowing you to breathe easier. Aesthetics. Stone flooring comes in all different colors, styles, and patterns. It has a cozy, natural feel, like hardwood, but with much more aesthetic versatility, like ceramic tile. And no two stone tiles are exactly alike. Since they’re natural, rather than processed and manufactured, each tile has different spots, veins, and coloring, giving your floor a uniquely beautiful and stylish look that can go with any home décor. Versatility. There are a number of different types of stone that can be used for flooring, each with their own feel and their own aesthetic, and each adding their own unique brand of charm to your home. Marble has an elegant and classy look that’s great for kitchens, especially when you add matching countertops. Slate is one of the most durable types of stone, and naturally waterproof. Granite is also very durable, and has a shiny, speckled look that’s great for bathrooms. Whatever your needs are, both aesthetic and practical, there’s a type of stone to fit them. Cooling Temperatures. Stone floors are a particularly good option in California, given the often unbearable heat. Stone is naturally cool, and installing it will help keep the rest of your home cool as well, during the summer months. With this natural cooling source, you’ll be able to rely less on your A/C and reduce your energy bills significantly. Warming Temperatures. What about during the winter? California can still get fairly cold at times, and there’s nothing worse than walking over a cold stone floor in your bare feet in the middle of the night. If you have indoor pets, it can be torture for them as well, particularly since they don’t have the luxury of wearing socks, shoes, or slippers. However, there’s a solution. Install radiant heating under the stone tiles. Turn it on when the temperatures start to drop, and the stone will absorb the heat, keeping your feet warm and comfortable all season long. These are just a few of the benefits of stone floors in your home. Think about what your needs are for your floors in each room, in terms of both design and functionality, and talk to a flooring expert to help you find a stone floor option that’s right for you.